The international arbitration proceedings in The Hague over the territorial dispute for Piran Bay between Croatia and Slovenia grinds to a halt, challenging the legitimacy of pre-EU accession promises made. The latest chapter of the ongoing maritime border dispute between Croatia and Slovenia took place last month, as the Permanent Court of Arbitration (PCA) in The Hague held a hearing to consider proceeding after Croatia’s withdrawal from the process in July 2015 following leaked recordings of unsanctioned phone conversations between Jernej Sekolec, a Slovenian PCA judge, and Simona Drenik, the representative of the Slovenian government. The initial border dispute between the two countries commenced after the break-up of Yugoslavia, pitting Croatia and Slovenia at odds over the rightful ownership of Piran Bay, a small area of water in the northern Adriatic Sea. During the time of Yugoslavia, there was no clear demarcation between the maritime borders of Slovenia and Croatia, although Slovenia was responsible for policing the bay. Slovenia has used this argument for its historic title to justify its claims to the area in question. Croatia has countered that in fact no border was ever established, so the argument for historic title is not valid. Thus, Croatia claims that the border should be an equal distance from the two countries’ shores, following the United Nations Convention on the Law of the Sea. Significantly, Piran Bay provides Slovenia’s sole access to the open sea; conversely, Croatia’s ownership of Piran Bay allows it to maintain a maritime border with Italy. The two countries have repeatedly tried to resolve their competing claims to the bay. 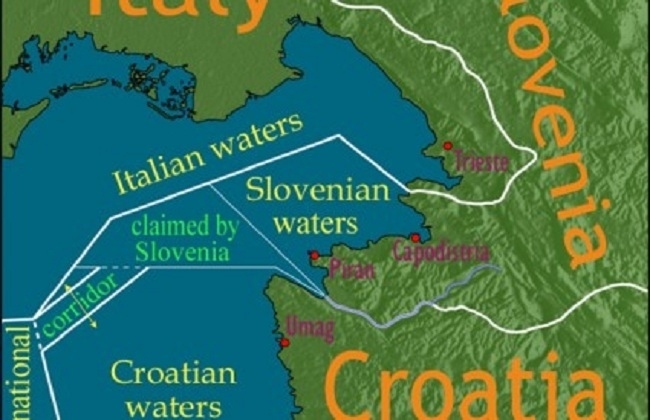 In 2001, Slovenian Prime Minister Janez Drnovšek and Croatian Prime Minister Ivica Račan signed the Drnovšek-Račan agreement, whereby Slovenia would keep approximately two thirds of the bay and Croatia would keep one third and a border with Italy. However, while the Slovenian Parliament ratified the agreement, the Croatian Parliament failed to do so. The disagreement has also been a source of conflict and confrontation on numerous occasions. For example, in 2004, Slovenia withdrew its support for Croatia’s accession to the European Union (EU) after the Croatian police arrested Janez Podobnik, a Slovenian Parliament member, and other Slovenian citizens in the bay. Slovenia again sought in 2008 to block Croatia’s EU negotiations until the conflict was resolved, and thus, the following year, EU Enlargement Commissioner Olli Rehn brokered a deal that would bring the dispute to international arbitration if Slovenia would remove its veto on Croatia’s EU accession. Slovenian Prime Minister Borut Pahor and Croatian Prime Minister Jadranka Kosor signed the agreement in November of that year. In June 2010, following demands by the opposition parties in Slovenia, Pahor held a referendum on the arbitration agreement, which narrowly passed with just under 52 percent of the votes in favor. The arbitration process began in June 2014 at the PCA after the Slovenian Parliament voted in favor of Croatia’s accession agreement in July 2013. However, in July 2015, Croatian newspaper Verenji list released recordings of unauthorized phone calls between Sekolec and Drenik, in which Sekolec provided confidential information based on discussions among PCA judges to Drenik, indicating that the ruling may be favorable to Slovenia, granting the country 75 percent of the bay. In response to the revealing of the recordings, Croatian Prime Minister Zoran Milanović stated on July 28, 2015, that he was seeking to have Croatia withdraw from the arbitration proceedings. “The credibility and integrity of the arbitration process as a whole have been to such an extent compromised that, unfortunately, Croatia is not of the opinion that the arbitration process can continue in this or a similar form,” Milanović wrote in a letter to Slovenian Prime Minister Miro Cerar. The Croatian Parliament voted in an extraordinary session on July 29 against the arbitration agreement with Slovenia, unanimously supporting the decision of the country’s government to withdraw from the process. Since the phone conversations were leaked, Croatia has upheld the position that it can settle the decades-long dispute through “bilateral negotiations, in the spirit of good neighbourly relations and in accordance with international law,” according to a March 17 press release from the Croatian Ministry of Foreign and International Affairs (MVEP). The PCA held its hearing on March 18 regardless of Croatia’s absence, acknowledging that it would consider Croatia’s arguments provided in letters to the PCA dated on July 24 and 31, 2015, as well as a note verbale from the Croatian MVEP dated on July 30, 2015, to the Ministry of Foreign Affairs of Slovenia. The PCA noted that Croatia’s note verbale to Slovenia claimed that Slovenia had breached the Arbitration Agreement and that the proceedings for the dispute had been “irremovably damaged, giving rise to a manifest violation of the rights of Croatia.” Meanwhile, Slovenia argued that there is no impediment for the PCA’s continued proceedings and that ending the arbitration process would break the deal negotiated whereby Croatia joined the EU by commencing arbitration proceedings. Following the hearing, the PCA stated that it will begin deliberations in light of the arguments offered by the two sides. “In the meantime, any consideration by the Tribunal regarding the merits of the underlying territorial and maritime dispute remains suspended,” the press release stated. The press release reiterated “Croatia’s position that the arbitration process was history,” while it reported that Erjavec stated, “Slovenia sees the arbitration agreement as an international agreement that is still in effect, we expect (the arbitration process) to continue and a ruling to be handed down,” noting that Slovenia is not considering other options for the resolution of the dispute. Thus, despite the reassurances of the foreign ministries, it appears that the two countries will remain at loggerheads over the dispute, with Slovenia awaiting the response of the PCA and Croatia seeking a bilateral solution. While the validity of the recorded phone conversations is not under question, it is unclear whether Croatia’s refusal to move on with the proceedings comes from a genuine belief that the proceedings have been irreparably “compromised” or instead because the verdict looked to be unfavorable to Croatia. All the same, that Slovenia, with the lowest ranking for corruption in southeastern Europe, was involved in such illicit backdoor conspiring does not give much hope for a transparent and legitimate resolution for other border disputes in the region. The border dispute between Slovenia and Croatia is only one of many that still haunt the former Yugoslav states. Currently, there are ongoing border disputes in a number of other countries: Croatia and Serbia, Croatia and Montenegro, Serbia and Bosnia and Herzegovina, Croatia and Bosnia and Herzegovina, and Serbia and Kosovo. The inability of Slovenia and Croatia, the only two EU members among the former Yugoslav states, to reach an acceptable agreement on this issue does not bode well for their southern neighbors. In 2012, a press release from the European Commission underscored the importance of setting a precedent of a friendly solution for this border dispute among the Western Balkan states. It is therefore not inconceivable that the failure of the proceedings will provide an equally negative political signal among the other former Yugoslav states. Aside from setting a poor example for the two countries’ neighbors, Croatia’s withdrawal from a process that it agreed to as part of its accession to the EU additionally jeopardizes the legitimacy of agreements that the EU makes with potential members. If a country is able to sign off on an agreement demanded by the EU (in this case, Slovenia) before joining and then renege on its commitment later on, this challenges the legitimacy of the entire EU accession process. Only recently has Croatia itself delineated two requirements that its neighbor Serbia must meet in order for it to approve of Serbia’s EU accession: Serbia must end its claims to jurisdiction for prosecuting war crimes in all former Yugoslav countries and guarantee the protection of the rights of the Croatian minority in Serbia. If Serbia were to follow on the precedent Croatia is currently setting, the country could accept these agreements to get over the hurdle of EU accession before in turn rejecting these demands or seeking alternative “bilateral negotiations, in the spirit of good neighbourly relations” at a point unspecified in the future. If other EU candidate countries such as Turkey, Macedonia, or Albania are similarly able to make agreements before joining the EU and then abandon these later on, the EU loses a vital bargaining chip in its foreign policy. The continued development, prosperity, and legitimacy of the EU depend on the fulfillment of international obligations and agreements. No matter the fault of Slovenia, Croatia’s unilateral withdrawal from the proceedings is hardly reassuring for the future fulfillment of obligations by EU candidate countries. The failings of the proceedings between Slovenia and Croatia will thus resound across the region.